This screening and performance program features artists wielding their voices against language – ‘acting out’ processes of ‘verbal brainwash’ (to use the term memorably coined by Swedish sound poet Åke Hodell). 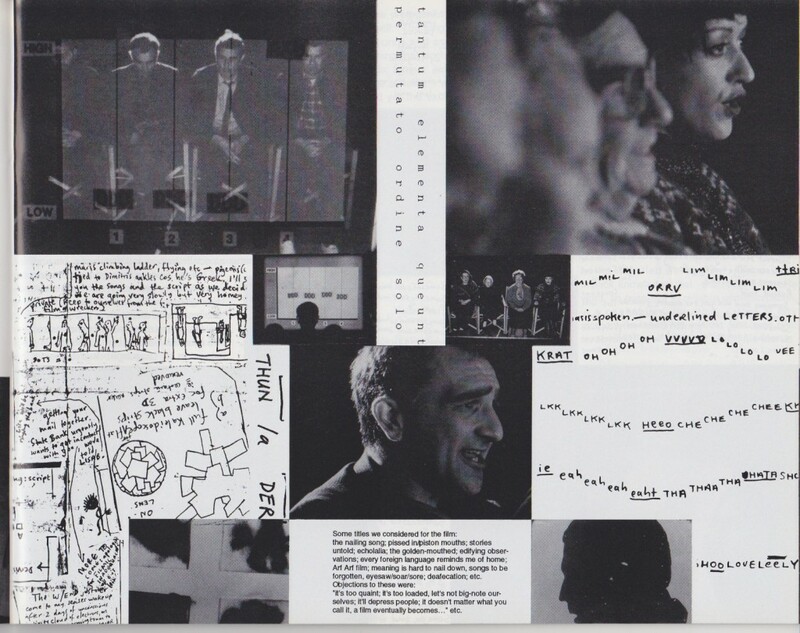 In experimental film-artist Dirk De Bruyn’s work, these gestures of syntactical erasure can be understood as a poetic practice which seeks to grasp preverbal early childhood states – an (inevitably futile) attempt to excise meaning from experiences, before language and its attendant comprehension of the world. De Bruyn attributes this impulse to his early immigration from The Netherlands to Australia, and the confusion he experienced in the consequent liminal space between cultures, identities and languages. His tumultuous performances, which typically begin and end in darkness, combine urgent vocal utterances – hollering, screaming and chanting – with the sumptuous illumination of projected film. De Bruyn’s vocalisations meld with and amplify the images’ blooming fields of colour and intricately layered, hand-animated imagery. 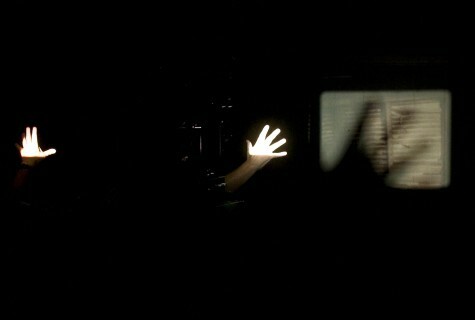 At Gertrude, Dirk will perform a new work for three 16mm projectors and voice entitled ‘i1234m’. 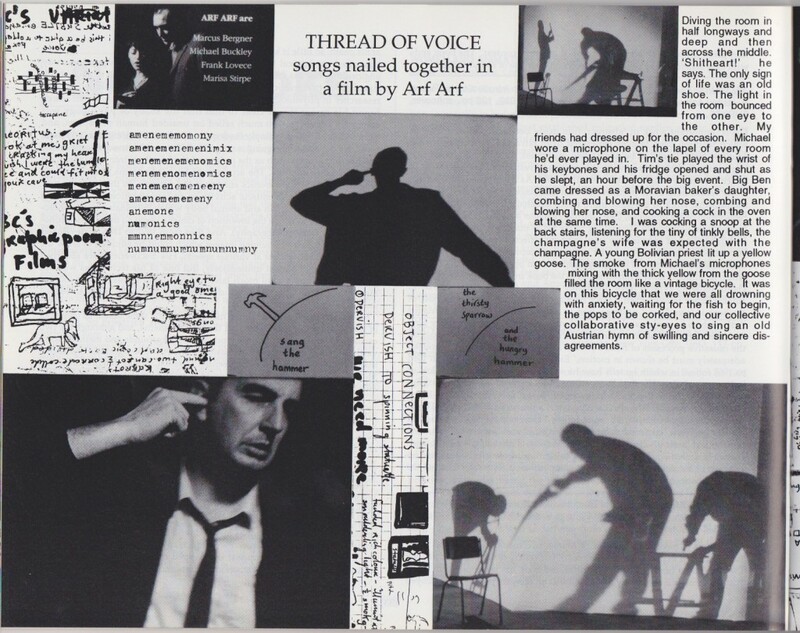 Sound Poetry ‘band’ Arf Arf’s first emerged following an impromptu gig at Caulfield Art Gallery in 1985 when Marcus Bergner called Frank Lovece at twenty minutes’ notice to ‘do something, anything’ to help him in a performance that was about to start. The subsequent show consisted of foot-stamping, yelping and microphones being rolled along the floor, a modus operandi that has only marginally evolved since. The first official Arf Arf performance took place soon after at the (now disappeared) Aberdeen Hotel in Fitzroy alongside another group making their debut, T.I.S.M., who Lovece decried for their mannered theatricality and artifice. Adopting a raw, punk ethos of demystification and ‘non-slickness’ (Lovece’s other band is ‘Primitive Calculators), Arf Arf were as likely to appear at The Tote as La Mama. Contra De Bruyn’s work, Arf Arf’s sound is less preverbal wonder of infancy, and more garbled vocalisation of adult disorientation. At Gertrude, Arf Arf members Frank Lovece, Luca Lovece, Marisa Stirpe and Michael Buckley will collectively perform a series of sound poems followed by a screening of 1993’s ‘Thread of Voice’, in which Arf Arf, as Adrian Martin writes ‘use their sound work to transform the medium and language of film – and vice versa’.